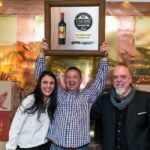 Since the inception of the Wolftrap Steakhouse Championships four years ago – involving both respected judges and the public at large – our clients Local Grill Parktown North (a 3 time winner) and Little Havana/Havana (a 1 time winner) have either won or have been runner up each year. This year 2016 the first three Local Grill Parktown North (winner), Little Havana (runner -up) and the Godfather (3rd placed) are ALL clients of Polar Africa! Could it be a coincidence, or just a massive coincidence, that all three steakhouses utilise Polar Africa’s Sorbite humidity and bacteria control filters in their respective dry and/or wet-aged cold rooms/chillers (or chillers from which they source their meat), which filters prevent hanging meat on the bone from excessively drying out and conversely limiting blood purge in vacuum/cryovac packaged wet-aged meat, resulting in juicy, tender and sumptuous aged-meat of choice?? ← Extended shelf life update ….